Voice service you can depend on. Are you looking for a reliable voice service? Does your business make a lot of calls? Ideal for larger offices, Optus MultiLine is a reliable digital telephony solution that can help you reduce call costs and boost productivity. You can connect with your customers, save time with optimised call handling, and have peace of mind with disaster recovery options - all with high reliability, 24x7 support, and great value for money. Here are just some of the many features and options that can help your business be more productive. A range of hunt group options to ensure incoming calls are distributed and answered efficiently. Flexible call number display allowing you to control the numbers displayed to your called party so they can easily identify you. 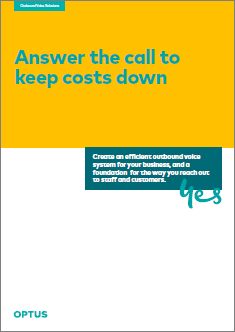 Call barring to help you control costs by restricting access to expensive call types. Number only diversion so you can advertise local numbers in locations where you have no offices and redirect calls to your main office. Business continuity features such as MultiLine dual exchange homing if one exchange or access link fails and MultiLine emergency or congestion diversions to redirect incoming calls to an alternate location. State Based MultiLines - allow telephone numbers for any location within a state on a single MultiLine reducing the number of voice gateways required. Service you can depend on - Your Optus MultiLine service provides reliable phone connections with disaster recovery options and 24 x 7 support. Easier cost management - Our powerful billing and reporting services can be tailored to your organisation’s requirements. And when you are ready to move to IP networking and IP voice trunking, Optus can provide a migration path to Optus Evolve Voice, part of our advanced Optus Evolve communications network. Optus MultiLine is a digital trunk telephone service for connection to offices with digital PBXs. Optus MultiLine is available in most CBD, metropolitan and major regional locations. For sites outside of the coverage area Optus Business Long Distance provides competitive call rates for national, international and fixed to mobile calls. User-friendly features, disaster recovery options, 24 x 7 operator service, flexible billing and the simplicity of dealing with a single telecommunications carrier all make your job of managing the telephone network easier. 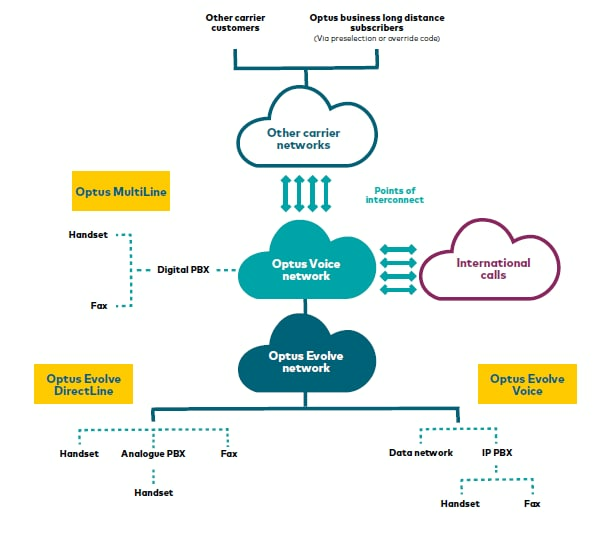 Optus MultiLine provides primary rate ISDN voice services, with each connection supporting between ten and thirty trunk lines. The Optus MultiLine service is monitored 24 x 7 by Optus and is backed by comprehensive SLA's. Optus Insight Plus, a powerful management reporting tool that analyses your call traffic, inventory and billing data. Data Feed, an ASCII representation of your billing data to keep as your detailed record or to use with your own applications to analyse the billing data. How detailed is the billing data? Billing for the MultiLine service can be itemised against individual extension numbers, allowing you to manage costs extension by extension. A complete digital voice solution for larger offices.